The potential and limits of functional foods in preventing cardiovascular disease; Assessing health claims for functional foods. Part 1 Diet, cardiovascular disease and diabetes: Diet and the prevention of coronary heart disease; The role of fat soluble nutrients and antioxidants in preventing heart disease; Vitamin E and other antioxidants in the prevention of cardiovascular disease; Iron intake and cardiovascular disease; Diet and diabetes: Prevention and control; Nutritional risk factors in the development of type 1 and type 2 diabetes. Part 2 Phytochemicals and cardiovascular disease: Flavonoids and cardiovascular disease; Isoflavones and coronary heart disease; Plant sterols and cholesterol reduction; Garlic and cardiovascular disease. Part 3 Controlling dietary fat: Diet, oxidative stress and cardiovascular disease; Dietary fat, pregnancy and the prevention of heart disease; Developing polyunsaturated fatty acids as functional ingredients; Marine micro-organisms as new sources of n-3 polyunsaturated fatty acids (PUFAs); Developments in fat replacers. Part 4 Starch and other functional ingredients: Starch in food, diabetes and coronary heart disease; The use of cereal beta-glucans to control diabetes and cardiovascular disease; Grain legumes and the prevention of cardiovascular disease; Food fermentation by lactic acid bacteria for the prevention of cardiovascular disease. Two introductory chapters provide a context for the rest of the book by assessing the potential of functional foods to prevent disease and the key issues concerning health claims. Part one examines the importance of diet in the prevention of cardiovascular disease and diabetes, with chapters on fat soluble nutrients, antioxidants and iron intake. Part two focuses on the role of phytochemicals in preventing cardiovascular disease, including chapters on isoflavones and plant sterols. Part three addresses the control of dietary fat, including the use of polyunsaturated fatty acids and fat replacers. 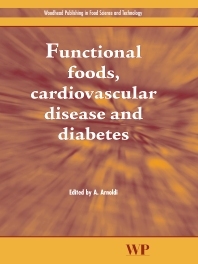 The final part of the book reviews the use of starch and other functional ingredients in controlling cardiovascular disease, with individual chapters on cereal beta-glucans, grain legumes and food fermentation by lactic acid bacteria. Functional foods, cardiovascular disease and diabetes is a standard reference for all those concerned with the role of functional foods in the prevention and control of cardiovascular disease and diabetes. Dr Anna Arnoldi is Professor of Food Chemistry in the Faculty of Pharmacy at the University of Milan, Italy.